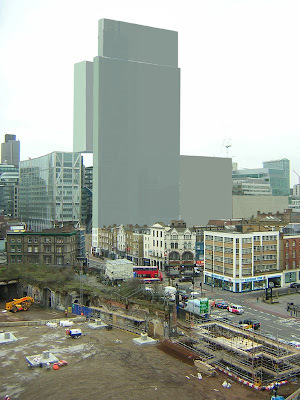 Hackney's report to its Planning Committee on 24 July, concerning Hammerson's 51-storey Bishops Place scheme planned for Shoreditch, indicated that the Council would like to spend substantially more public money propping up Transport for London's private towerblock scheme at Dalston Junction. 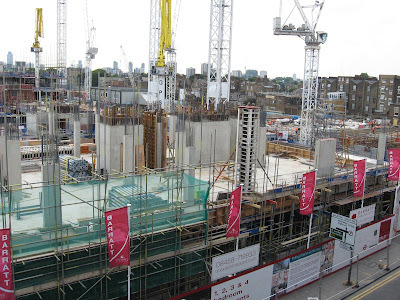 Hammerson's Bishops Place scheme on land owned by Hackney Council. Hackney has already subsidised TfL's £39million concrete slab over the new Dalston Junction station by demolishing historic buildings and disposing of its flattened site for a peppercorn to the developer, Barratt. The lack of any affordable housing on TfL's site has been an embarassment to the authorities. Hackney hoped that Hammerson would sign up to planning agreements providing for a £14million payment towards "off site affordable housing". Hackney proposed to then take the money from Shoreditch to subsidise housing on TfL's Dalston site - robbing Peter to pay Paul. However the Planning Committee, which had convened for a special meeting, decided to defer consideration of Hammerson's Shoreditch application. The Dalston developer, Barratt, has been in serious financial difficulties with the crash in development land values and house sales. Its recent renegotiation of covenants with its bankers has been described in the Financial Times as "lifting the coffin lid a fraction." Other house builders are reported to be in even worse financial trouble and there is talk in government circles of intervention if insolvent house builders abandon unfinished developments. There is however no sign of Barratt pulling men off the Dalston Lane development site and leaving us with concrete stumps. But TfL have been reported recently to have expressed doubts about the use of the concrete slab for a bus turnaround above the new Dalston Junction station - the cost of which predetermined the whole logic of the Dalston towerblocks scheme. OPEN objections to the scheme included a concern that it was a "profligate use of financial and natural resources". OPEN has previously written here about how Hackney's beancounters were going bananas in Ridley Road market. We told the story of Janet Devers who is the sister of Colin Hunt, one of the original metric martyrs. The Council are prosecuting Janet for selling by the pound whilst not also showing prices in kilos, and for selling unweighed fresh produce by the bowl or the bunch. Now you can hear what Janet herself has to say in this video. Sadly the situation has got much worse. Recently the Council have applied to add another 9 charges to those which Janet will face in the Crown Court jury trial in January. The Council are also making new allegations about her brother Colin. And evidence has now come to light which, reports suggest, show that Colin and Janet are being deliberately targeted for punitive action by the Council. A spectre of corporate malice is said to be stalking Ridley market. The traders of Ridley Road Market in happier times - a day out for the ladies. Hackney's Mayor Pipe has rubbished the traders protests that over regulation is driving them out. As for the recent disconnection of all the electrics in the market that is, he says, because the installations are damaged and dangerous due to traders breaking in to steal electricity. Nothing to do then with the last Council refurbishment of the market's electrics being so shoddy that it was unable to produce an electrician's certificate that the work was up to health and safety standards. So. No electric, no electric scales. The traders will just have to rely on their clunky old fashioned manual scales for their weights and measures which are only in er... pounds and ounces. Mayor Pipe has also denied plans for Olympic redevelopment of market land. But he has yet to give his view of the consultant's recommendation to redevelop the market's Birkbeck Road site for residential use. Or to explain why its market's store has been left derelict for so long. Do you know anyone in this photo? What are they saying? But the news is: it's happened near you. Going to put a road through there? 'Look! ', they say, 'The area will die. Only available from brandname shops. There'll be a new library. Not canyons between tower blocks. A revolution in thinking, a retail opportunity. The shopkeepers and tenants have to quit. But it's too late to stop. Of the developers' bank accounts. Mayor Boris Johnson is a fan of the Hackney Peace mural on Dalston Lane. (1 minute 10 seconds in). Thanks to Clapton Pond blog for spotting this one.